5 Things to Know About the Warsaw Ghetto Uprising: Aaron Bandler, Jewish Journal, Apr. 19, 2018— The focus this week has been on Israel’s 70th anniversary as a country, but April 19 is an important day, the 75th anniversary on the Warsaw Ghetto Uprising. Abusing Anne Frank’s Memory: Dr. Manfred Gerstenfeld, Arutz Sheva, Apr. 12, 2018 — Anne Frank has probably become the best known Jewish person murdered during the Shoah. Why Holocaust Education Is Desperately Needed in America: Noah Phillips, Algemeiner, Apr. 23, 2018 — I recently applied for a grant to promote Holocaust education at local middle schools through field trips, an education unit about Holocaust studies, and survivor testimonies. Jewish Power at 70 Years: Bret Stephens, New York Times, Apr. 20, 2018— Adam Armoush is a 21-year-old Israeli Arab who, on a recent outing in Berlin, donned a yarmulke to test a friend’s contention that it was unsafe to do so in Germany. The focus this week has been on Israel’s 70th anniversary as a country, but April 19 is an important day, the 75th anniversary on the Warsaw Ghetto Uprising. People across the country in Poland stood in silence as bells and sirens rang to honor that the Jews that lost their lives in the uprising. The uprising was a significant event, as the Jews imprisoned in the ghetto bravely fought back against the barbaric Nazis and threw a temporary wrench in their war efforts. Here are five things to know about the Warsaw Ghetto Uprising. Prisoners in the ghetto vowed to take arms against the Nazis after the first wave of deportations from the ghetto occurred in 1942. Adolf Hitler ordered all the prisoners in the ghettos to be deported to the Nazi death camps, resulting in the deportation of over two million Jews to the death camps, including 300,000 from the Warsaw Ghetto. Those in the Warsaw Ghetto who watched in horror as their loved ones were being snatched away by the Nazis vowed to take vengeance against the SS, even if it meant death. “Never shall the Germans move from here with impunity; we will die, but the cruel invaders will pay with their blood for ours,” Warsaw Ghetto survivor Emmanuel Ringelblum wrote. The resistance in the ghetto consisted of two main groups: the Jewish Combat Organization (ZOB) and the Jewish Military Union (ZZW). During the first two-month wave of deportations to Treblinka in July 1942, the two groups were unable to form an effective coalition because of tension between the two. According to Yad Vashem, “The ZZW claimed that the ZOB refused to incorporate them into their group’s structure, while the ZOB maintained that the ZZW wanted to take over the operation. In addition, both groups imposed taxes on the ghetto’s wealthier Jews, causing more tension between them.” Making matters worse was the fact that the ZOB was fractured by varying factions and they did not have a sufficient amount of arms despite the ZZW’s links to the Polish Home Army. After the first wave of deportations ended, the ZZW and ZOB realized they had to set their differences aside in other to have a fighting chance against the Nazis. Over the next couple of months, new life was breathed into the ZOB with the acquisition of some weapons from the Polish Home Army and having a new leader in the charismatic 23-year-old Mordechai Anielewicz, who declared that the Jews would “resist going to the railroad cars,” per Jewish Virtual Library. The Jews in the ghetto were able to fight off the Nazis from deporting them in January 1943. The deportations at that time had caught the Jews in the ghetto off guard, but they were able to use the structure of the ghetto to their advantage. According to Britannica, “Jewish fighters could strike quickly, then escape across the rooftops. German troops, on the other hand, moved cautiously and would not go down to cellars.” The resistance efforts prevented the Nazis from issuing their planned deportations that day, giving the Jews imprisoned in the ghetto a sliver of hope. They spend the next few months stockpiling a few more weapons, training and establishing hiding spots in the ghetto to use as guerrilla warfare against the Nazis. The uprising officially began on April 19 and lasted until May 16. The Jews in the ghetto had heard that the Nazis were preparing to fight and deport the remaining prisoners in the ghetto to Treblinka on April 19, so they retreated to their hiding spots and fired away at the Nazis when they entered. Despite being vastly outnumbered and outmanned in firepower, the Jews forced the Nazis to abandon their three-day plan of complete liquidation of the ghetto. Even when the Nazis began burning down the ghetto, the Jews were able to hold their ground for nearly a month before the Nazis eventually overwhelmed them. The Jews that hadn’t died in battle were either executed by the Nazis or sent to the death camps. Even though the uprising did not prevail against the Nazis, it inspired other uprisings elsewhere. For instance, when the Jews entombed in Treblinka got word of the Warsaw Ghetto Uprising, they planned an uprising of their own, setting the death camp into flames and killing 40 Nazi guards. Three hundred people escaped Treblinka that day but only 70 survived, as the Nazis hunted down those that escaped. Other uprisings occurred in the ghettos of Bialystok and Minsk and the Sobibor death camp. The Warsaw Ghetto Uprising was a signal at that time that the Jews would not be herded like sheep into slaughter, they were determined to fight back and “die with honor.” As Journal columnist Ben Shapiro noted in 2004, Anielewicz had written during the uprising, “The most important thing is that my life’s dream has come true. Jewish self-defense in the ghetto has been realized. Jewish retaliation and resistance has become a fact. I have been witness to the magnificent heroic battle of the Jewish fighters.” “A new model of the Jew had been created: not a passive Jew, but a Jew who would battle to the last bullet,” Shapiro wrote. Anne Frank has probably become the best known Jewish person murdered during the Shoah. Her memory is also one of the most abused. This maltreatment has a long history. New examples emerge frequently. One among many: in January 2018 the Italian first division soccer club Lazio was fined 50 000 Euro after supporters displayed anti-Semitic Anne Frank stickers before a game in October 2017. Other distortions of Anne Frank’s memory have also come out of the Netherlands. In Amsterdam in February 2007, graffiti appeared showing Anne Frank with a keffiya. In 2008, the same picture was turned into a commercial postcard. That despite the fact that the majority party in the only Palestinian parliamentary elections in 2006 was Hamas, which aims for genocide of the Jews. In 2006 a Belgian-Dutch Muslim Group posted a cartoon of Anne Frank in bed with Hitler. The motif of the Palestinian Anne Frank returns regularly. It recently appeared on posters and flyers at Wits University in Johannesburg. It was promoted by the Palestinian Solidarity Campaign during Israel Apartheid Week. In 2017 a freelance guide at the Anne Frank Center in Berlin compared the suffering of Jews under the Nazis to that of Palestinians under Israeli control. The center distanced itself from his statement. A new play based on Anne Frank by Ilja Pfeiffer is being shown in the Netherlands. The play transforms one of the people in hiding with her, Fritz Pfeffer, from a victim to a perpetrator of violence. He was murdered in the Shoah. This play in which a Holocaust victim’s memory is sullied is one more example of the partial degradation of Dutch society whose government will not admit how its Second World War predecessors in exile greatly failed the persecuted Jews. The “Palestinian” Anne Frank is an inversion of the Holocaust. Another major distortion of the Holocaust is its de-Judaization. In 1952, an English translation of the diary was published for the American market. It was titled Anne Frank: The Diary of a Young Girl. David Barnouw, a researcher formerly with the Dutch Institute for War Documentation (NIOD), wrote that the foreword was written by Eleanor Roosevelt, widow of the wartime president, Franklin Delano Roosevelt. In this text, the terms “Jew” or “persecution” of Jews were not mentioned at all. Frances Goodrich and Albert Hackett wrote a play based on the diary which premiered in 1955 in New York. Barnouw writes, “Of course the adaptation of a book or in this case a diary [to a stage play] cannot be totally true to the original. But the fact that there was a Hitler and national socialism as well as anti-Semitism and that Anne was persecuted as a Jewish girl has been pushed to the background.” An earlier play written by Meyer Levin had a much more Jewish content but was rejected by many producers. How could someone minimize the relevance of the Holocaust and trivialize its intergenerational impact? I was stunned. In response, I began researching the Holocaust education programs implemented by my school and others. In my school — a private institution with a significant Jewish student population — I expected a robust layering of Holocaust studies across grade levels. Instead, I found one unit on Anne Frank in the middle school and an overview of the Holocaust in the European history elective. This lackluster effort to incorporate Holocaust education into the regular curriculum, along with the lack of any special programming, left me wondering about students’ exposure to genocide studies and the specific case of the Holocaust. Maybe it’s my personal observations and bias, but I imagine that my school’s curriculum is indicative of a larger trend. Per a 2005 report by the Education Commission of the States, Holocaust education is partially mandated in some form by only 17 US states. Alabama, California, Georgia, Mississippi, Nevada, New Jersey, North Carolina, South Carolina, Tennessee, and West Virginia have created commissions and task forces on the Holocaust. California, Connecticut, Florida, Illinois, Massachusetts, New Jersey, New York, Rhode Island, and Washington state have passed laws requiring or encouraging educational programs about the Holocaust as part of the curriculum. But even in these states, the commissions and task forces are the sole bodies responsible for the implementation of this agenda, and many of the members of the task forces are volunteers. Without any proactive enforcement, what good are these policies? What impact can they have? There’s wiggle room for teachers and educators to eschew Holocaust education, not necessarily out of malignancy, but for convenience or pressure to “cover” major units of studies. The rationale is understandable: sacrifice this effectively optional state “encouragement” for the more typical school curriculum in preparation for state tests or other components of compulsive education. And this is assuming that teachers at the school level are even made aware of the Holocaust requirements by their supervisors. There is certainly visible variation in the productivity of the respective state commissions. New Jersey’s commission coordinates hundreds of programs annually for tens of thousands of students in grades K-12, per their 2016 report. But broadly speaking, the legislation around mandated Holocaust studies programs — and the implementation of the curricula — are feeble. My personal Holocaust education has included my family’s visit to Yad Vashem in Jerusalem and the Museum of Jewish Heritage in New York, hearing from survivors, reading testimonies, as well as Night by Elie Wiesel, and commemorating the Shoah annually. The Holocaust means more to me than a chapter (or page) in a history textbook. And I hope for Jews and non-Jews across the nation to eventually share this sentiment. But as of now, it appears that the majority of my generation — the upcoming wave of activists, entrepreneurs, and intrepid thinkers — may never learn about an essential component of American and global history. It’s a vow not likely to be fulfilled. There were nearly 1,000 reported anti-Semitic incidents in Berlin alone last year. A neo-fascist party, Alternative for Germany, has 94 seats in the Bundestag. Last Thursday, a pair of German rappers won a prestigious music award, given largely on the basis of sales, for an album in which they boast of having bodies “more defined than Auschwitz prisoners.” The award ceremony coincided with Holocaust Remembrance Day. To be Jewish — at least visibly Jewish — in Europe is to live on borrowed time. That’s not to doubt the sincerity and good will of Maas or other European leaders who recommit to combating anti-Semitism every time a European Jew is murdered or a Jewish institution attacked. It’s only to doubt their capacity. There’s a limit to how many armed guards can be deployed indefinitely to protect synagogues or stop Holocaust memorials from being vandalized. There’s a limit, also, to trying to cure bigotry with earnest appeals to tolerance. The German government is mulling a proposal to require recent arrivals in the country to tour Nazi concentration camps as a way of engendering a feeling of empathy for Jews. It doesn’t seem to occur to anyone that, to the virulent anti-Semite, Buchenwald is a source of inspiration, not shame. All this comes to mind as Israel this week marks (in the Hebrew calendar) the 70th anniversary of its independence. There are many reasons to celebrate the date, many of them lofty: a renaissance for Jewish civilization; the creation of a feisty liberal democracy in a despotic neighborhood; the ecological rescue of a once-barren land; the end of 1,878 years of exile. But there’s a more basic reason. Jews cannot rely for their safety on the kindness of strangers, least of all French or German politicians. Theodor Herzl saw this with the Dreyfus Affair and founded modern Zionism. Post-Hitler Europe still has far to fall when it comes to its attitudes toward Jews, but the trend is clear. The question is the pace. Hence Israel: its army, bomb, and robust willingness to use force to defend itself. Israel did not come into existence to serve as another showcase of the victimization of Jews. It exists to end the victimization of Jews. That’s a point that Israel’s restless critics could stand to learn. On Friday, Palestinians in Gaza returned for the fourth time to the border fence with Israel, in protests promoted by Hamas. The explicit purpose of Hamas leaders is to breach the fence and march on Jerusalem. Israel cannot possibly allow this — doing so would create a precedent that would encourage similar protests, and more death, along all of Israel’s borders — and has repeatedly used deadly force to counter it. The armchair corporals of Western punditry think this is excessive. It would be helpful if they could suggest alternative military tactics to an Israeli government dealing with an urgent crisis against an adversary sworn to its destruction. They don’t. It would also be helpful if they could explain how they can insist on Israel’s retreat to the 1967 borders and then scold Israel when it defends those borders. They can’t. If the armchair corporals want to persist in demands for withdrawals that for 25 years have led to more Palestinian violence, not less, the least they can do is be ferocious in defense of Israel’s inarguable sovereignty. Somehow they almost never are. Israel’s 70th anniversary has occasioned a fresh round of anxious, if not exactly new, commentary about the rifts between Israeli and Diaspora Jewry. Some Diaspora complaints, especially with respect to religion and refugees, are valid and should be heeded by Jerusalem. 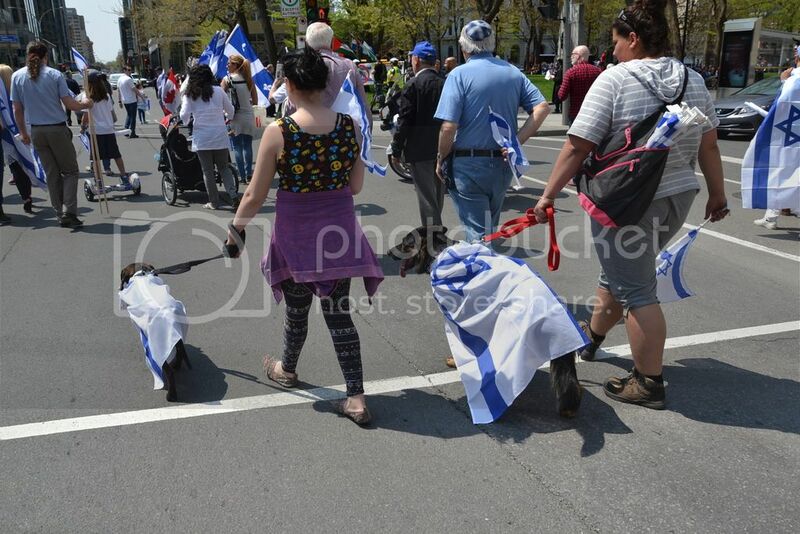 But to the extent that the Diaspora’s objections are prompted by the nonchalance of the supposedly nonvulnerable when it comes to Israel’s security choices, then the complaints are worse than feckless. They provide moral sustenance for Hamas in its efforts to win sympathy for its strategy of wanton aggression and reckless endangerment. And they foster the illusion that there’s some easy and morally stainless way by which Jews can exercise the responsibilities of political power. Though not Jewish, Adam Armoush was once one of the nonchalant when it came to what it means to be Jewish in the 21st century. Presumably no longer. For Jews, it’s a painful, useful reminder that Israel is not their vanity. It’s their safeguard. David S. Wyman, 89, Authored a Controversial Book About the U.S. Inaction on Jews During the Holocaust: Hillel Italie, Globe & Mail, Apr. 4, 2018—David S. Wyman, a leading scholar of the U.S. response to the Holocaust whose The Abandonment of the Jews was a provocative, bestselling critique of everyone from religious leaders to president Franklin Roosevelt, died Wednesday at age 89. The History and Future of Holocaust Research: Wendy Lower, Tablet, Apr. 26, 2018—In early 1947, the Chief Counsel of the United States Nuremberg Military Tribunals, Brigadier General Telford Taylor prepared indictments against the second tier Nazis. By then the liberation of the concentrations camps, and the research, testimony and publicity surrounding the international trial against the Nazi leadership, had revealed the horror and extent of the regime’s war crimes and crimes against humanity. From 1930s to 2018: ‘Kill Lists’ Target ‘Jewish Hollywood’: Abraham Cooper & Harold Brackman, Jewish Journal, Apr. 25, 2018—President Harry Truman once wrote, “The only thing new in the world is the history you don’t know.” But sometimes what you don’t know can put you at risk — or worse. Nicholas Rose of Irvine, a 26-year-old teacher of English as a Second Language (ESL), faces a six-year-plus sentence for recent violent anti-Semitic threats against prominent Jews in the entertainment industry. Luckily, he was turned in by his parents. The Untold Story of the Ritchie Boys: Brian Bethune, Maclean’s, Jul. 20, 2017—Martin Selling, 24, was undergoing training as a U.S. Army medical orderly in February 1943 and chafing under a Pentagon policy that kept him—a Jewish refugee from Germany and hence an “enemy alien”—away from any combat unit. He’d endured a lot already, including three brutal months in Dachau concentration camp after Kristallnacht in 1938, before finding haven in America. The knowledge that his adopted country would not let him fight their common enemy was bitterly frustrating. As the democratic Jewish state of Israel turns seventy, what is the historical-societal balance sheet? What is the meaning of modern Israel—which only three generations ago had to fight for its very existence against five invading Arab armies—both for the Jewish people and the world? First, modern Israel is today one of the world’s most successful societies. Its standard of living ranks with the West European countries; a nuclear power, its IDF is considered among the top armies in the world. Its dynamic yet stable economy is outstanding, and technologically (including a remarkable space/satellite program) Israel outranks every major country save for the United States. Arab and leftist propaganda notwithstanding, Israel is the region’s only democracy, in which Arabs and Christians, as well of course as the Jewish majority (6,556,000 out of a total 8,793,000), are represented in the Knesset. (And Israel’s growth rate, at 2% in 2015, averaging three children per woman, is three times greater than the OECD’s). The Jewish state has peace treaties with two former Muslim enemies, Egypt and Jordan, increasingly good relations with Saudi Arabia and the Gulf states, and with great powers like China, Russia and India. Its largest economic partner is the European Union, its closest ally the world’s only superpower, the USA, especially under Donald Trump—and U.S. popular support for Israel is, at 75%, the highest ever. Indeed, we rightly marvel at the breathtaking rapidity, in what seems a blink of an historical eye. of modern Israel’s transformation from a tiny, poor state created just three years after the horror of the Holocaust, into a modern, dynamic regional hegemon. Initially hanging by a thread as the Arabs attempted to strangle it in its cradle, then successfully accepting and integrating hundreds of thousands of Ashkenazi survivors from Europe and Sephardic expellees from Arab countries, Israel became a flourishing democracy, an advanced military power, and a dynamic economic-technological powerhouse—the world’s leading advanced “start-up nation”. live morally, to speak truth to Power and, through his mastery of nature, to create, minimize suffering, and create a harmonious human community. Still, Israel lives in a notoriously unstable and dangerous neighborhood, and in a larger post-World War II world which, despite modernity’s many achievements, is also a dangerous, and often unstable, place. And while regionally Israel is in better shape today than at any point since 1947-48, the collapse of many Islamic states into crisis and civil war after the so-called Arab Spring created surrounding instability, above all in civil-war wracked, and Russian- and Iranian-occupied, Syria. Syria today is a failed state, with half a million dead, civilian and military, and ca.11 million internal and external refugees (half its total population). It is also a potential flashpoint—pro- and anti-Assad forces jostle up against assorted Islamists, Russians, Hezbollah, Iranian forces, Turks and, in the north-east, Kurds and Americans. An unforeseen incident (e.g., Israel’s efforts to prevent the arming of Lebanese Hezbollah by Iran through Syria, the Turks new incursion against Kurdish forces in north-east [Afrin) could, despite “deconfliction” agreements, trigger a wider war. And behind the Syrian situation is Israel’s one major, continuing existential problem, the terrorist-expansionist Shiite mullah-cracy of Iran, a Holocaust-denying Islamic fundamentalist entity sworn to destroy the Jewish state and well on its way (despite-or because of—the Obama nuclear pact) to becoming a missile-armed nuclear power. Preventing the devolution of the Syrian situation, blocking Iranian expansionism (in Syria, Iraq, and Yemen) and creation of a nuclear weapon, are Israel’s major political necessities (the instability in Hamas-occupied Gaza is also concerning.) Iran cannot be allowed to establish permanent bases along Israel’s northern border with Syria, and any move to create atomic weapons must be blocked. Whether this can be achieved without direct Israeli (or U.S.-Israeli) military intervention, remains moot. action, they do not—save for an Iranian nuclear weapon— threaten Israel’s, or the Jewish People’s, existence. political spectrum, a changed reality: continuing Palestinian rejectionism, division (Abbas-Fatah-West Bank vs. Hamas-Gaza), and economic crisis, and a flourishing post l967 Israeli population in Judea and Samaria, has relegated the Palestinian issue to the political back burner. Indeed, Donald Trump’s recent, historic recognition, after twenty years of Presidential avoidance, of Jerusalem as Israel’s historic capital, is a key policy shift reflecting—despite ongoing Palestinian, UN, and EU opposition—the simple fact of modern Jewish Israel’s normalization, and permanence, in the region and in the world. Of course, the Book of the Future is always difficult to read, and capable of unforeseen surprises. Nevertheless, we are right today to celebrate the miracle of our reborn State’s joyous seventieth birthday. Its history shows us that while those who oppose, and often oppress, us, come and go, am Yisrael chai, the eternal Jewish people, lives! On May 12th 2016, the Montreal community gathered to celebrate sixty-eighth birthday at yet another beautiful celebration at Phillips Square. 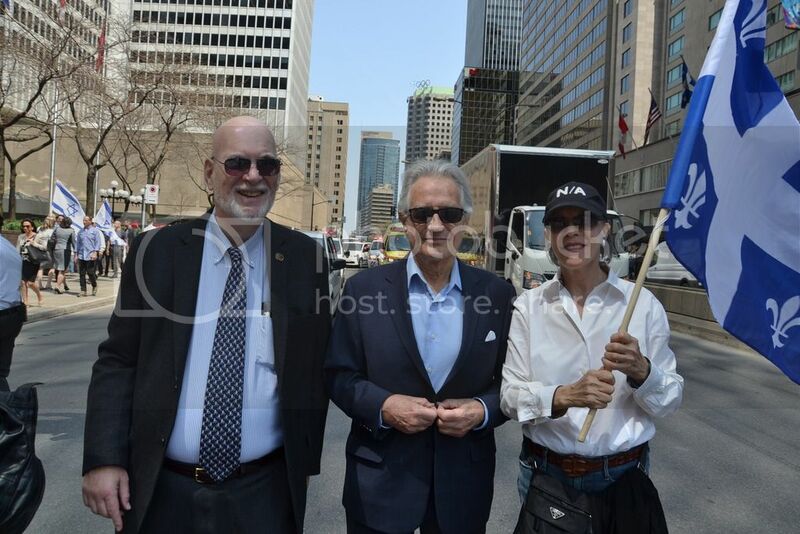 Of course, CIJR was front and center to join in on the festivities and march from Phillips Square to Place du Canada to show our support for Israel. 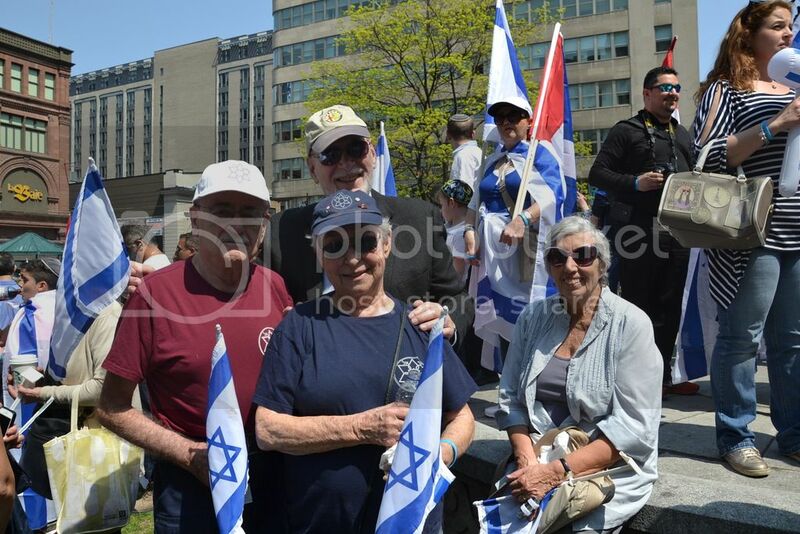 Thanks to everyone who came out to make this year's Yom Ha'atzamut celebrations a truly remarkable one! 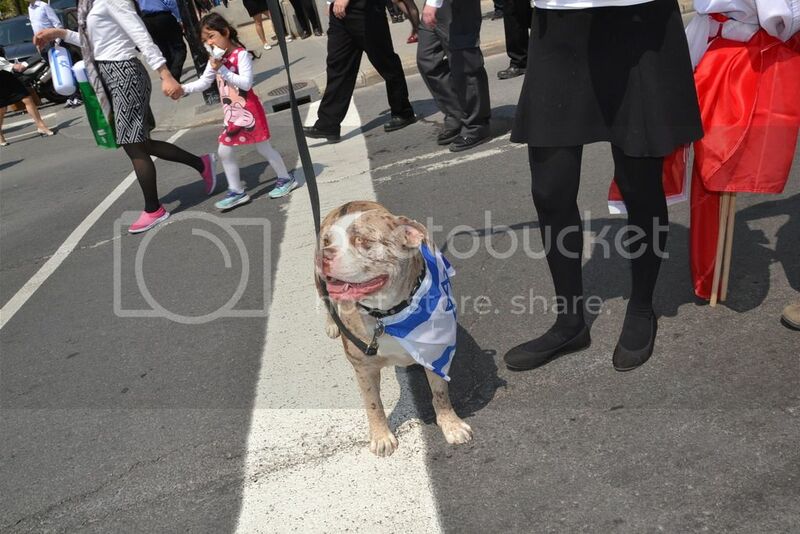 Yom Ha'atzamut is a celebation for everybody! 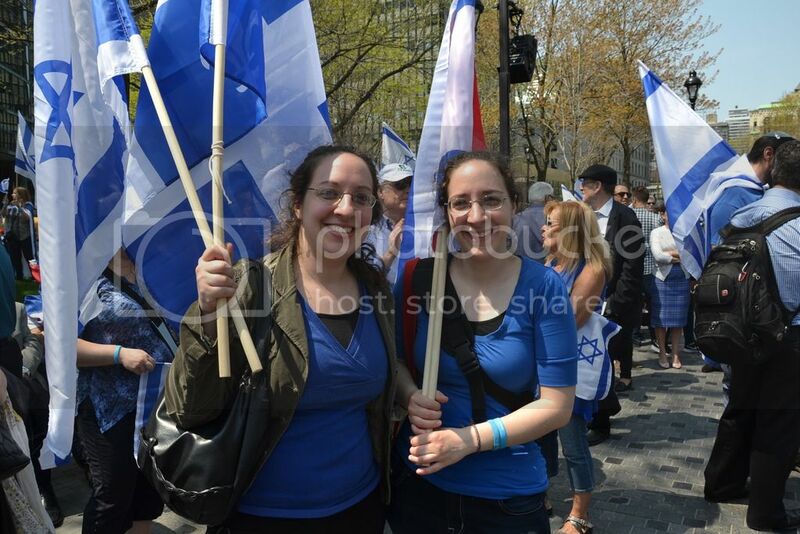 Thanks for making Yom Ha'atmazut truly remarkable! See you next year! 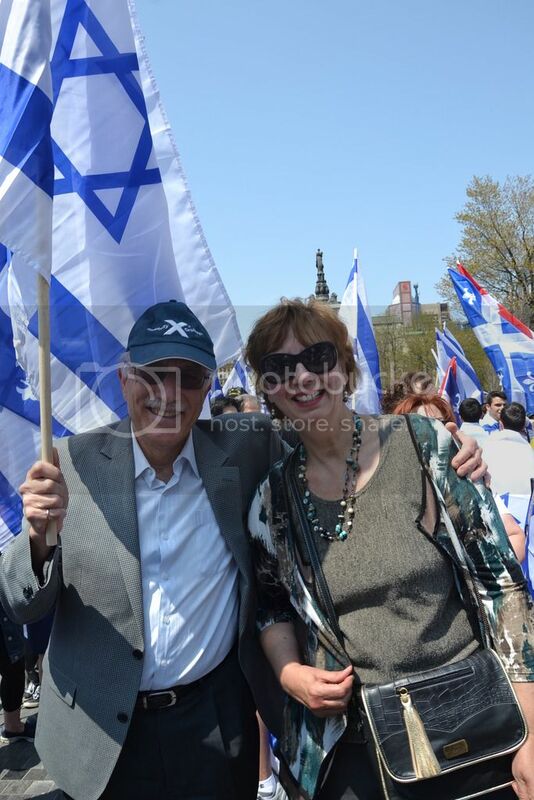 Israel, 65 Years Young! : Baruch Cohen, CIJR, Apr. 16, 2013—On Friday May 14, 1948 (5 Iyar 5708) the State of Israel came into being with a population numbering 650,000. Immediately the young state had to weather the assault of five regular Arab armies actively aided by one million Palestinian Arabs. Israel's Declaration of Independence: Israel Minister of Foreign Affairs, May 14, 1948—The Land of Israel was the birthplace of the Jewish people. Here their spiritual, religious and political identity was shaped. Here they first attained to statehood, created cultural values of national and universal significance and gave to the world the eternal Book of Books. Israel’s Resurgence: A Spiritual Calculus: David M. Weinberg, Jerusalem Post, Apr. 11, 2013—Press reviews of the state of this country on its Independence Day commonly miss the spiritual, meta-historic significance of Israel’s achievement. They tend to calculate a balance sheet of successes and failures in defense, economy, democracy and peacemaking, but fail to fathom the processes at work behind the curtain of current affairs. Independence Day and the Zionist Vision: Isi Leibler, Jerusalem Post, Apr.14, 2013—As we launch into our 65th Independence Day celebrations it is timely to review and rationally assess the extent to which our Zionist objectives have been achieved. When the Jewish state was proclaimed in 1948, the 650,000 Jews who constituted the Yishuv were totally engaged in a desperate battle to repel the combined military forces of our Arab neighbors, who from the outset were determined to deny Jewish sovereignty. In memory of all the victims of Israel’s wars, who gave their lives against unending Arab aggression. On Friday May 14, 1948 (5 Iyar 5708) the State of Israel came into being with a population numbering 650,000. Immediately the young state had to weather the assault of five regular Arab armies actively aided by one million Palestinian Arabs. It must be remembered that the Jewish State, the State of Israel, was born of a strong desire for sovereignty, independence and freedom and was won by the Jewish People, who had gathered their power and their strength against the onslaught of her enemies! Never again would there ever be another Holocaust. Israel’s population today is eight million and growing. The State of Israel is here forever! “And I will give you peace in the land, and you shall lie down, and none shall make you afraid.” (Leviticus 26:6) Am Yisroel Chai! Hag Sameach! Arthur Szyk from his hagaddah. On May 14, 1948, on the day in which the British Mandate over Palestine expired, the Jewish People's Council gathered at the Tel Aviv Museum, and approved the following proclamation, declaring the establishment of the State of Israel. The new state was recognized that night by the United States and three days later by the USSR. ERETZ-ISRAEL [(Hebrew) – the Land of Israel, Palestine] was the birthplace of the Jewish people. Here their spiritual, religious and political identity was shaped. Here they first attained to statehood, created cultural values of national and universal significance and gave to the world the eternal Book of Books. After being forcibly exiled from their land, the people kept faith with it throughout their Dispersion and never ceased to pray and hope for their return to it and for the restoration in it of their political freedom. Impelled by this historic and traditional attachment, Jews strove in every successive generation to re-establish themselves in their ancient homeland. In recent decades they returned in their masses. Pioneers, ma'pilim [(Hebrew) – immigrants coming to Eretz-Israel in defiance of restrictive legislation] and defenders, they made deserts bloom, revived the Hebrew language, built villages and towns, and created a thriving community controlling its own economy and culture, loving peace but knowing how to defend itself, bringing the blessings of progress to all the country's inhabitants, and aspiring towards independent nationhood. In the year 5657 (1897), at the summons of the spiritual father of the Jewish State, Theodore Herzl, the First Zionist Congress convened and proclaimed the right of the Jewish people to national rebirth in its own country. This right was recognized in the Balfour Declaration of the 2nd November, 1917, and re-affirmed in the Mandate of the League of Nations which, in particular, gave international sanction to the historic connection between the Jewish people and Eretz-Israel and to the right of the Jewish people to rebuild its National Home. Survivors of the Nazi holocaust in Europe, as well as Jews from other parts of the world, continued to migrate to Eretz-Israel, undaunted by difficulties, restrictions and dangers, and never ceased to assert their right to a life of dignity, freedom and honest toil in their national homeland. In the Second World War, the Jewish community of this country contributed its full share to the struggle of the freedom- and peace-loving nations against the forces of Nazi wickedness and, by the blood of its soldiers and its war effort, gained the right to be reckoned among the peoples who founded the United Nations. Press reviews of the state of this country on its Independence Day commonly miss the spiritual, meta-historic significance of Israel’s achievement. They tend to calculate a balance sheet of successes and failures in defense, economy, democracy and peacemaking, but fail to fathom the processes at work behind the curtain of current affairs. It’s valid to apply temporal yardsticks of measurement to Israel, but such evaluations undershoot the deeper challenge: to understand the resurgence of Israel in grand historical terms; to discern the mystic movement, the divine drama – if you will, at play. It cannot be otherwise. There is nothing global, or even massive, about the State of Israel in political terms. This is a small piece of earth. We Israelis are but a tiny fraction of the human family. In the sweep of history, there have been greater battles, larger transfers and emigrations of populations, bigger construction and technological projects, more eminently impressive displays of might. So in secular terms, Israel is not all that a big deal. But as vindication of spirit; as validation of tenacious faith; as proof of the Jewish People’s, indeed humanity’s, power to overcome – Israel’s establishment and advancement is a very big deal indeed. History knows no parallel to the prophecies of the Bible, which foretold the break up of a people into a thousand pieces across the world, yet one destined to persevere for centuries and return to their indigenous homeland. This is a defy-all-odds saga of metaphysical union spanning centuries between a people, their G-d, and a land. This, wrote the late ambassador Dr. Yaakov Herzog, “is the celebration of a nation who, at the moment of ultimate nadir, of devastating Holocaust, rose from the ashes, armed with little more than conviction and a historical consciousness that promised renewal, to stake claim to their ancestry. This is redemption, providential consolation. “The still small voice of Israel reborn has a significance overreaching the criterion of material capacity, extending beyond the boundaries of geographical dimension and the gradation of international status. Israel represents a vindication of faith and prayer through the ages; it is a symbol of revival, a message of hope, indeed a lasting evidence of the integrity of the spirit,” Herzog said. This belief in the power of Jewish history, animated by ancient faith, explains much about Israel today. It explains our willingness to sacrifice so much for independence. It explains our drive to succeed in the arts and sciences and to share our advances with the world. It explains our attachment to Jerusalem. It explains why we sometimes stubbornly refuse to accept rational calculations of diplomatic cost and benefit politely impressed on us by well-meaning allies. It explains why those who consider history only in terms of national politics and international relations underestimate or misjudge us. They fail to understand that Israel is guided by an astral calculus that is not always perceptible. Our deep sense of historical mission blurs the lines between imagination and reality, between the possible and the feasible. Not everybody in this country is religious in terms of the practice of traditional Judaism. But just about everybody is religious in the sense of feeling part of a grand meta-historic journey that is connected to spiritual powers and a moral heritage invested in the Jewish People that has sustained us and returned us to the Land of Israel. Consider the Talmud’s metaphor for the resurgence of Israel. “The Lord your God will turn your captivity… and gather you from all the nations,” speaks Deuteronomy 30:3. Read not “turn your captivity,” says the Talmud, but rather “return Himself” from captivity. In other words, G-d is returning to the Land of Israel too, bit by bit, along with us. His presence in the Land of Israel, and His protection, grows with every new immigrant stepping off the plane and every house we build. Regrettably, many of us seem to have lost the capacity to think in providential terms; to discern historical movement, not momentary difficulty; to see the forest, not the trees; to disregard the mud and focus on the magnificent. On Independence Day, it is time to remind ourselves (and our global friends) of this prophetic perspective on the meaning and success of Israel. As we launch into our 65th Independence Day celebrations it is timely to review and rationally assess the extent to which our Zionist objectives have been achieved. When the Jewish state was proclaimed in 1948, the 650,000 Jews who constituted the Yishuv were totally engaged in a desperate battle to repel the combined military forces of our Arab neighbours who from the outset were determined to deny Jewish sovereignty. In their wildest dreams, the founders of our state fighting a war of survival could never have envisioned the dynamic and thriving nation of eight million citizens that would emerge from that maelstrom. Indeed, by any benchmark, taking into account numerous wars, failures and disappointments, this extraordinary Jewish nation-state will indisputably be recorded in the annals of history as one of the greatest successes of the past millennium. There is no historical situation which remotely compares to the Jewish people’s renaissance and transformation into a Jewish nation. After being exiled for 2,000 years to all parts of the globe and having suffered endless cycles of discrimination, persecution, exile and mass murder culminating in the genocidal horror of the Shoah, we reconstituted ourselves into a nation state. Like a phoenix rising from the ashes, an ingathering of the exiles took place with Jews from all over the globe flocking to find haven in the newly established Jewish state. There, against all odds, they bonded together into a melting pot of Shoah survivors, refugees fleeing persecution in Arab countries, Jews escaping from the underdeveloped societies of Ethiopia, and from discrimination in the former Soviet Union – and succeeded in creating one of the most vibrant and resilient societies in the world. The ancient and sacred Hebrew language has been revived as a living, pulsating cultural force and lingua franca for Jews, uniting those from totally different cultures. There has been a renaissance of Torah study with greater numbers of Jews familiar with the traditional texts and teachings of Judaism than at any period in our history. Who could possibly have imagined that a people, subjugated and powerless for 2,000 years, would emerge in a very short space of time, as a dominant regional military superpower able to deter and defend itself against the vastly numerically superior military forces of its combined regional adversaries? Who could have dreamt that this tiny, arid strip of land would become the fulcrum for a dynamic economy and emerge as the second-largest hi-tech start-up nation in the world, exceeded only by the United States? And as a special gift, on the eve of our 65th anniversary, this country, devoid of the oil reservoirs which have empowered some of our adversaries, virtually overnight became energy self-sufficient and is now even exploring markets to export its surplus gas resources. Our spectacular success far exceeded the expectations of our idealistic founders. By any rational benchmark it would be deemed a modern-day miracle. And yet despite this, there are those in our midst who constantly whine about our failings and transform self-criticism into masochism. Instead of celebrating they predict doom and gloom. There is also a tiny, but highly vocal minority who disparages our achievements and complains about the sacrifices required to ensure our security and existence, some of whom even mock Zionism and challenge the merits of Jewish statehood. Also there are some young Jews, never having experienced the dehumanizing impact of powerlessness on the Jewish psyche, who take the State of Israel for granted. They never underwent the chilling experience of their European antecedents in Europe who in the 1930s desperately sought – mostly unsuccessfully – to obtain entry visas to countries to escape the impending Nazi genocidal onslaught. And nor do they appreciate the soul-destroying impact of living in an environment of anti-Semitic incitement where Jews are considered pariahs and the mainstream media shamelessly promotes frenzied anti-Israel and anti-Semitic stereotypes. However, despite the prevailing belief that after the revelation of the horrors of the Shoah, anti- Semites would become an extinct species, the world’s oldest hatred has returned with a vengeance, particularly in Europe, whose soil had been drenched in Jewish blood only a few years before Israel’s independence. The extent of the current European malaise is exemplified by youngsters in some public schools seeking to hide their Jewishness in order to avert torment or social exclusion. In many European cities there is also a growing reluctance to outwardly wear Jewish symbols like kippot to avoid random violence from hooligans in the street. But today, almost half the Jewish people are happily domiciled in Israel. The word happily should be stressed because despite our masochistic self-criticism and endless complaints, all polls show that Israelis are numbered amongst the happiest and most satisfied people in the world. Our numbers will increase and an ever-growing proportion of global Jewry will return to live in its homeland, increasingly out of choice rather seeking a haven. Thus, as we celebrate Israel’s 65th anniversary, notwithstanding all the challenges and threats confronting us, we should remind ourselves of our humble origins and give thanks to the Almighty for having enabled us to be the blessed generation that is privileged to live in freedom in this extraordinary country, our ancient homeland. Chag Sameach! 65 Years of Innovation, from Rummikub to the ‘God Particle’: Marcella Rosen, Times of Israel, Apr. 15, 2013 —While a great deal of international and media focus has been placed on Israel’s military conflicts, the country quietly has become an energetic, ambitious incubator of entrepreneurialism and invention. What follows is a timeline chronicling some of the most important and interesting innovations produced by Israelis during their country’s 65-year existence. Independence Day for the Secular And Religious: David Newman, Jerusalem Post, Apr. 14, 2013—Tonight there will be an assortment of celebrations to commemorate Yom Ha’atzmaut. Most of the country will watch the official transition from Remembrance Day to Independence Day in the impressive ceremony which takes place on Mount Herzl and the lighting of the six torches by Israeli citizens representing different walks of life. That will be followed by a night of partying and fireworks. In Israel We Feel at Home: Raanan Shaked, Ynet News, Apr.16, 2013—It's been 65 years and we haven't gotten used to it yet, huh? Sixty-five years, and it still seems like a big deal to us, that there is an entire country here that is totally ours, in our hands, under our control, without a responsible adult to actually tell us what to do. Israelis Overwhelmingly Proud of Their Country, New Poll Shows: Aharon Lapidot, Israel Hayom, Apr. 15, 2013—Some 92% of Israel's Jews say they are very proud or somewhat proud of their nationality • A clear majority say they are Jewish first and only then Israeli, but sense of bond with Diaspora drops slightly • Israel's population reaches 8,018,000, a 4.8% increase from last year. Visit CIJR’s Bi-Weekly Webzine: Israzine. CIJR’s ISRANET Daily Briefing is available by e-mail. Please urge colleagues, friends, and family to visit our website for more information on our ISRANET series. To join our distribution list, or to unsubscribe, visit us at http://www.isranet.org/. The ISRANET Daily Briefing is a service of CIJR. 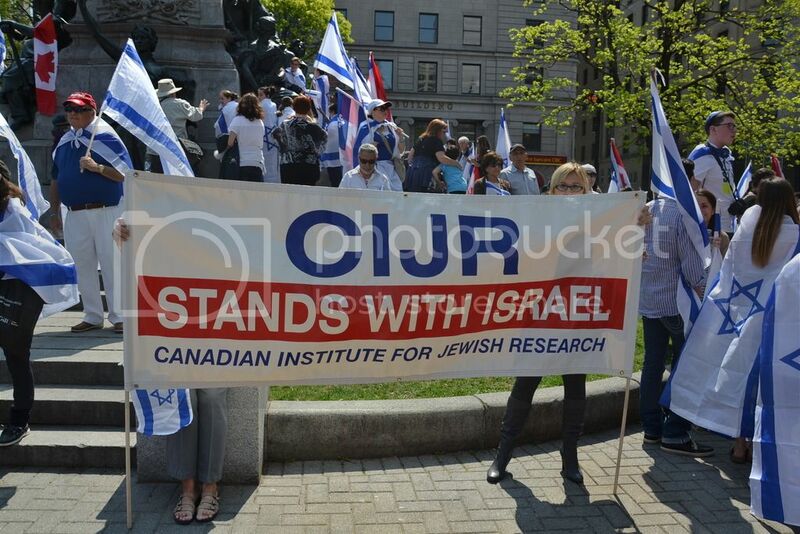 We hope that you find it useful and that you will support it and our pro-Israel educational work by forwarding a minimum $90.00 tax-deductible contribution [please send a cheque or VISA/MasterCard information to CIJR (see cover page for address)]. 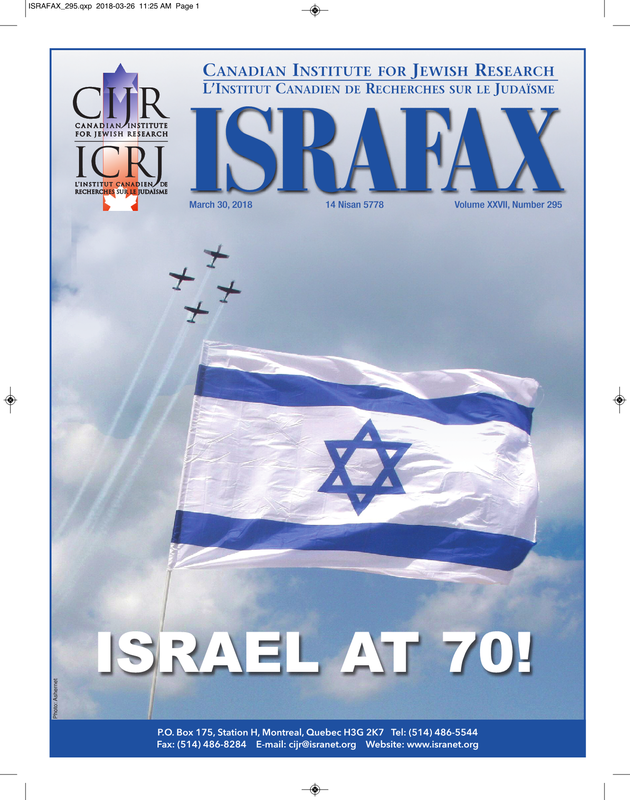 All donations include a membership-subscription to our respected quarterly ISRAFAX print magazine, which will be mailed to your home. CIJR’s ISRANET Daily Briefing attempts to convey a wide variety of opinions on Israel, the Middle East and the Jewish world for its readers’ educational and research purposes. Reprinted articles and documents express the opinions of their authors, and do not necessarily reflect the viewpoint of the Canadian Institute for Jewish Research. “And what glory awaits the selfless fighters for the cause! That is why I believe that a wonderful breed of Jews will spring up from the earth. The Macabees will rise again.”—Theodor Herzl, The Jewish State, Herzl Press, (N.Y., 1970), p. 110. Theodor Herzl was the father of the modern Zionist movement. He, more than any other, shaped and channelled the millennial, theological yearnings of Return to Zion into a modern political movement: Zionism. Of all the revolutionary national ideologies that sprang onto the political horizon during that time, the Herzelian Vulcan forged Zionism into the most triumphant, one which flourished and eventually evolved into the State of Israel, and which alone survives until today. Theodor Herzl’s dream became a reality due to the sacrifices of all of Israel’s daughters and sons, who adhered to the principles and values of Zionism and Jewish national Peoplehood. As Am Israel today celebrates its 64th birthday, let us commit ourselves to ensuring that Israel always remains strong, powerful, successful, and, above all, true to Jewish history and Jewish values—to the fulfillment of Theodor Herzl, David Ben Gurion, and Menahem Begin’s dreams. As Israel turns 64, we have much to be proud of. But we do not always appreciate our many achievements. We agonize over the Iranian nuclear threat, endlessly debating the pros and cons of a preemptive military strike against an Islamic Republic run by apocalyptic mullahs who have expressed their desire to wipe Israel “off the map.” But we, a people who just last week commemorated the Holocaust—the ultimate price paid for Jewish powerlessness—forget to appreciate having the option of launching such a strike single-handedly if we need to. And while we are the strongest military might in the region, we are also the most restrained and most moral. We take to the streets to protest the high cost of living, skyrocketing housing prices, and the general difficulties of making ends meet every month—and the government does its best to listen, a testament to democracy in action. But we forget to appreciate our low unemployment rate, brisk GDP growth and general economic stability at a time when much of the western world—in particular the US and Europe—is in the throes of one of the worst economic downturns in recent history. But there is another central idea in Judaism called ahavat yisrael—love of Israel. A hypercritical approach to Jewish sovereignty must be buffered by equally strong expressions of love, commitment and appreciation for the Jews living in Israel.… [And] do [our hypercritics] believe that we, who suffer the direct consequences of the ongoing conflict, do not wish to live in peace with our neighbors? As Israel turns 64 the Jewish people has much to be proud of. Let’s all learn to appreciate the achievements while recognizing the challenges. Sixty-four years ago Israel declared her independence. Israel’s independence would have been short lived were it not for the strong will of President Harry S. Truman, who became the new Jewish State’s first international supporter, not because of any political stance, but because he thought it was the right thing to do. “What I am trying to do is make the whole world safe for Jews,” Harry Truman wrote as he agonized over his decision to recognize a Jewish state in Palestine. Secretary of State George Marshall was just as opposed to the creation of Israel as Truman was for it. Clark M. Clifford, Special Counsel to President Truman at the time, remembered the internal US fight regarding the recognition of the Jewish State—the final discussion in the oval office. The meeting turned out to be an angry battle with Clifford and the President on one side, Marshall and Undersecretary of State Robert Lovett on the other. The argument used many of the same memes as used today. At 4 p.m. Friday May 14, 1948 just before the start of Shabbat, David Ben-Gurion read a 979-word declaration of independence in front of a small audience at the Tel Aviv Art Museum. He finished in his usual terse manner: “The state of Israel is established! The meeting is ended.” At midnight, British rule over Palestine lapsed; 11 minutes later White House spokesman Charlie Ross announced U.S. recognition. “At our last meeting, after a very interesting talk, I told him that as a foreigner I could not judge what would be his place in American history; but his helpfulness to us, his constant sympathy with our aims in Israel, his courageous decision to recognize our new state so quickly and his steadfast support since then had given him an immortal place in Jewish history. Of all the events surrounding modern Israel’s rebirth—the rise of the Zionist movement, the first and second aliyahs, the building of pre-state institutions in the Yishuv—by far the most important, at least for the prospects for peace, spring from the War of Independence itself, because the competing “narratives” about that period lie at the heart of the Arab-Israeli conflict. If, as is believed almost uniformly throughout the Arab world, Israel was born in original sin, if the Jews really did ransack placid Arab villages, murdering children in front of parents and parents in front of children, and expelling whoever was left, then Arab hatred for Israel and Jews would be understandable, as would their fundamental refusal to really make peace with Israel. Despite the Yishuv’s attempts to live peacefully with their neighbors, the leader of the Palestinians, the Grand Mufti Haj Amin al Husseini, chose to make common cause with the Nazis, meeting Hitler and Himmler in Berlin and pushing them to accelerate the slaughter of the Jews, and helping to create Muslim SS units in the Balkans that committed bloody war crimes against both Christians and Jews. The Mufti’s actions directly implicated the Palestinian movement in the Holocaust, but the Jews still tried to reach an accommodation with their Arab neighbors. When the United Nations in 1947 passed a resolution to partition the Palestine Mandate (or what was left of it, since most of the original territory had been lopped off by Britain to create Jordan) into a Jewish and an Arab state, the Jews supported the plan despite being deeply disappointed with how little land they would receive. The five Arab states in the UN all denounced the resolution (UNGA 181), voted against it, and together with the Palestinian representatives vowed to go to war to kill it. This Palestinian refusal to accept statehood was no fluke—they have refused statehood at least two more times since 1948. In the summer of 2000, President Bill Clinton presented his plan (the Clinton Parameters) at Camp David, which would have created a Palestinian state in the West Bank and Gaza, with a shared Jerusalem and free passage. Israel’s Ehud Barak accepted the Clinton plan, but Arafat refused it, and rather than making a counter offer instead returned home and launched the second intifada, or violent uprising, in which more than a thousand Israelis were killed. In the sixty-four years that the revived country has existed, there has been a dramatic population shift. Western and Eastern Europe and Russia, where the majority of Western Jews once lived, now hold a fraction of the Jewish population. The Muslim world, former location of the majority of Eastern Jews, is barely worth mentioning. Had Europe not imploded so badly in the twentieth century, the history of the Jewish State might have been quite different. Israel’s Second Commonwealth didn’t manage to attract a majority of the Jewish population from Babylon and the various Greek states. Israel’s Third Commonwealth was in better shape, despite the tiny borders and constant threats, but it is doubtful that it would have the population that it does today, if Jewish life in the Eastern Hemisphere had not become so impossible. To survive the hostility and chaos of the Eastern Hemisphere, Jews crossed the ocean to the Americas and rebuilt a fortified republic in their homeland. In the natural course of events, the republic would have mainly picked up idealists, nationalists and the devoutly religious. It would have been a viable country, but a smaller one, with more in common with Ireland than its energetic overcrowded self. [Israel] won its independence as an infant, at 19 it defeated seven armies. At 40 it launched its first rocket into space. At 44 it made a terrible life decision that it has still to recover from. It is 64 now, and yet booming with life, with anger, love, doubt, fear and a thousand other human tremors. It has gathered to itself the dead lost in the ashes and seen them born again amid its rebuilt ruins. It has stood on ancient mountains and reseeded the land and made it green again. It has reclaimed a legacy of a lost people and a lost land better than even its dreamers and visionaries could have imagined. Who knows what it will do next?